In the last few years, public rent-a-bike systems have been flourishing. Although the concept isn't new, the recent success of these systems has been made possible by automated lock/unlock systems, where riders can get access to a bike using a credit card. This takes labor out of the loop, and keeps bikes from being stolen. Now a designer is suggesting that these locks are, by themselves, all that would be needed to get a city's residents riding. 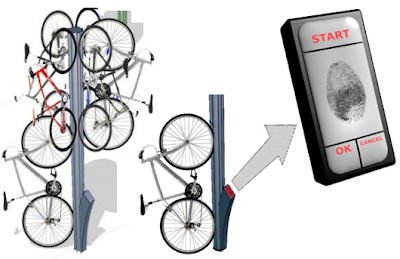 Abhinav Dapke designed a concept for a "bike tree" that uses a rider's fingerprint to lock and unlock their bikes. The tree-shaped stand saves space and discourages tampering. Geneva has something similar like this installed in a few locations, but this seems like a simpler, more elegant solution.